The Ultimate List of Stocking Stuffer Ideas for Adults! 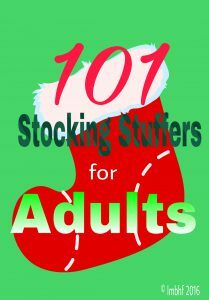 101 Stocking Stuffer Ideas for Adults! Looking for Stocking Stuffer Ideas for Adults? Well here it is, the Ultimate List of 101 gifts that the adults on your list would LOVE to receive in their Christmas Stockings! A wonderful list of ideas Lori! There have been many times this list would have been very helpful to me, including this year. Thank you for sharing it with us at the #BloggingGrandmothersLinkParty and thank you for co-hosting! I’ve pinned and shared. I d? not even know how I ended up here, but I tho?ght this post was good. I do not know who you ?re but certainly you’re going to a famous blogger if y?u are not already Cheers! Hi, Lori – I often run out of ideas for finding appropriate stocking stuffers for friends and family. Thanks for this list. I will definitely be using it! There are some great ideas here, Lori. Thanks for resource. I need all the help I can get. Happy holidays! There are a ton of great ideas on this list! I will be referring to it this Christmas! Shared! Thank you Lori for linking up and co-hosting with me at the #BloggingGrandmothers End of the Year Link Party 2018! « The Ultimate List of 101 Stocking Stuffer Ideas for Kids!